Ross is making his international début for Ireland at Karlstad, so it’s his turn under the spotlight! Who would play you in a movie of your life? – Daniel Craig. Your best quality? – Sense of humour. And your worst? – Sense of humour. Top of your wish list? – Win the World Seniors. On a day off we’ll find you? – Swimming, Climbing, Golfing. Starstruck moment? – Mixed Doubles with Jackie Lockhart. Your coffee order? – Americano. Where would you time travel to? – Wembley, 29 April 1967, England 2, Scotland 3. What do you like spending money on? – Flowers for Alison (actually my car!). Most underrated virtue? – Team bonding. Celebrity crush? – Sue Barker. Philosophy of life? – Who dares wins. 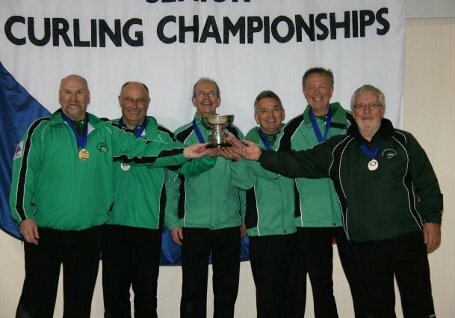 Ireland men’s senior curling team – Johnjo Kenny, Bill Gray, David Whyte, Tony Tierney and David Hume, sponsored by Albert Bartlett, become World Champions after a 6-5 extra end victory against Canada. Here is Louise Kerr’s final blog from Tårnby …..
MENS FINAL – IRELAND 6 CANADA 5 – AFTER EXTRA END. Ireland’s mens senior curling team – Johnjo Kenny, Bill Gray, David Whyte, Tony Tierney and David Hume stand on the top the world senior curling rankings this morning after winning gold at an extra end against the hot favourites Canada yesterday afternoon at Tårnby curling rink in Copenhagen in a roller-coaster World Seniors final. The rink here in Copenhagen erupted in delight for the Irish when Canadian skip Kelly Robertson’s last draw to the four foot was heavy. But the momentum had been taken away from the Canadians a few minutes earlier when Irish skip Johnjo pulled off the most fantastic last gasp triple runback that left the Irish lying shot and half guarded. The team came into the final knowing they had a medal in the bag, but having got to the final undefeated in nine games, they all realised it was the gold they wanted. After canny exchanges in the first few ends, a big four in the fourth end put the Irish firmly in the driving seat. The Canadian skip had tried to raise one of his own front stones into a bunch of stones in the head, but caught it too thin. Johnjo saw he had a straightforward double to spring the two Canadian stones left in the house. ‘The Big Man’ absolutely nailed it. 4-1 to Ireland at the half time break. Could they really do it? It was never going to be easy against Canada and the nerve ends were frayed among the Irish supporters and the team then gave up four shots against the head as the team from Manitoba clawed their way back. The sixth end was a nightmare from an Irish point of view. Error after error was punished and when Bill Gray’s last attempt to draw behind two guards, which was perfect for weight, was over-swept, it wasn’t looking good. With two Canadian stones hidden in the house, Johnjo’s only shot was a tricky double but he caught the guards losing a two. The Irish were now in the last chance saloon in the eighth end but every single one of them kept their nerve and played what was asked of them. Although Canada lay two, Johnjo cooly drew the four foot for the extra end. Excitement in the packed gallery upstairs was at boiling point as things came down to the wire and it was all going Canada’s way in the decider. 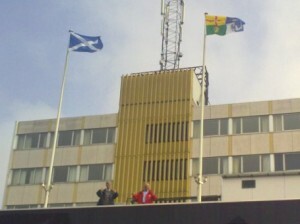 The Canadians also had the last stone so the Irish needed to conjure up something very special. With four stones to come, with his first, Johnjo drew to the top of the four foot sitting in front of two Canadian stones sitting in square on the tee line. Robertson’s reply was to draw a third shot in, trying to get a rub off his own stone and block the Irish raise. But the Canadian yellow stones sat in a semi circle. Johnjo and his third Bill discussed their options and elected to hit the Irish front stone into the Canadian shots. It would have to be a miracle shot – and it was! Played a strike weight, it rammed the Irish stone into the nest of Canadian stones, moving them all, leaving the Irish lying shot and half guarded at the edge of the four foot. Afterwards, Johnjo said that when all the granite had finally come to rest he had looked down and thought: ‘Yes. I’ll take that’. Ireland, one of the smallest curling nations in the world had just beaten the biggest in a world championships. Not only did they win gold they went through the whole championships, ten games, undefeated. Every members of the team has been immense this week. Johnjo with his tactical brilliance and shot making under pressure has proved his mettle. Bill Gray has pulled off a clutch of crucial shots just when the team needed them and none more so than the double take out across the house that turned the semi final against Norway in Ireland’s favour. David Whyte has been steady as a rock and must have had percentages in every game in the nineties. Tony Tierney has had a great tournament at lead and Irish statisticians have now lost count of the tick shots he made – the hardest shot in the book. David Hume has been a superb fifth man, looking after the team and giving them 100 per cent support on and off the ice. 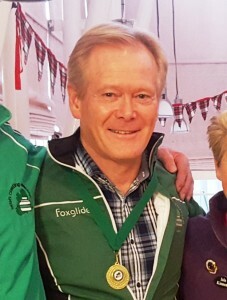 Finally, the team would not have got up the mountain to gold without the help over the last few weeks of Irish Coach Gordon McIntyre. As always, Gordon put his heart and soul into his role and gave the winning team the valuable help and advise they needed when they needed it. The question now is will they defend the title next year? Some feel it’s best to go out at the top and let others try and match what they have achieved. But there is always the thought – what could be better than defending the title in Canada and beating the Canadians again but this time on their home patch. 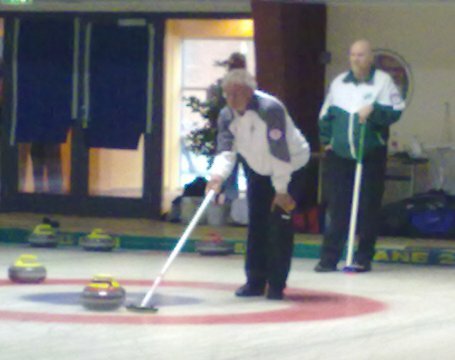 Our Mens team took part in the World Seniors Curling Championships held in Tårnby, Denmark from 14-21st April 2012 . There were 24 mens teams (split into 3 groups of 8) competing. The Mens team are The World Seniors Curling Champions 2012 and take home the Gold Medal – a brilliantly played championship. You can find the event scores, statistics and standings here. The WCF results and statistics can be viewed here for the Men. Our Womens team entered the World Senior Championships 2012 held in Tårnby, Denmark from 14-21st April 2012. There were 14 womens teams (split into 2 groups of 7) competing. 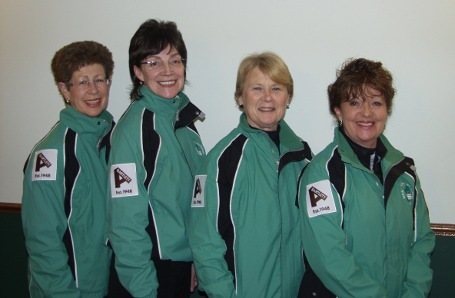 This year our roving reporter and member of the ladies team, Louise Kerr, provided us with the Irish Seniors Team Daily Blog. The Womens team finished 4th in their group. The WCF results and statistics can be viewed here for the Women. WOW! WOW! WOW! BOYS IN THE FLAMIN’ FINAL!! WE ARE SOOOOOO PROUD OF THEM. Anyway, the blog update…. 9:00am MENS SEMI FINAL – IRELAND 5 NORWAY 4 – AFTER AN EXTRA END. In what was a world class semi final the Irish mens seniors team – Johnjo Kenny, Bill Gray, David Whyte, Tony Tierney and fifth man David Hume beat the legend that is three-time world curling champion Eigel Ramsjfell and his Norwegian team at an extra end to go through to the world senior curling championship final against Canada. With the hammer in the extra end, Irish skip Johnjo Kenny, who has been immense all week, held his nerve to nail his last take out – surely the most important shot of his long curling career. The game in the first half was a case of draw hit, draw, hit, hit, hit, draw. Ramsjfell must have though he was playing the world semi in 1984 again. But a rare mistake from Johnjo at the fifth end, when he freshed a take out, opened the door for the Norwegian skip to draw for two. In the sixth end with the score at 1-3, Johnjo played a great runback with his first stone to lie two. Norway hit but rolled into open and ‘The Big Man’ hit for a two. 3-3. The seventh end was the killer punch from the Irish. It was not looking good for the team as the Norwegians were lying two tucked nicely in behind cover. But, Irish third Bill Gray played the shot of his life when played a fantastic across the house double to take out two Norwegian stones and lie shot behind the front guards. Norway attempted to angle a front stone onto the shot at back-ring weight but got it too thin and it rolled over the top. Ramsjfell drew second shot but Johnjo guarded and snuffed out the raise leaving the Norwegian with no shot at all. A steal of one took the score to 4-3. Norway took their one at the last end when Ramsjfell drew the button and this enthralling semi moved into the extra end. All the team played their part in keeping the four foot clear for their skip, but Bill Gray’s second peel just clipped an Irish stone five feet outside the house and moved it to about a foot to the right of the centre line. Norway pounced. They tried to draw behind but each time left the hit on. Ramsjfell drew, Johnjo, taking about 18 inches of ice played a hack weight hit and stick, Ramsjfell did the same. Silence fell in the Taarnby curling rink as Johnjo sat down in the hack. He took the same ice, played the same weight, the sweepers and Bill in the head judged it to perfection. It sailed past the guard by about an inch but it seems to take an eternity after that before it hit the Norwegian shot and stuck for the match winner. 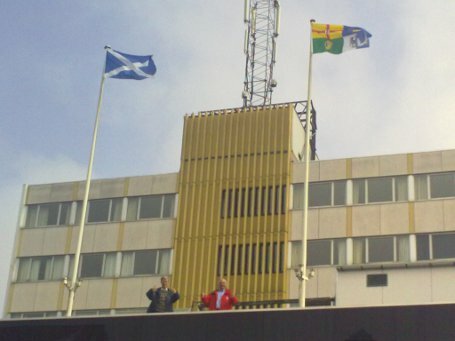 Tony Teirney and Tommy Campbell and the Irish and Scottish flags flying above the hotel at lunchtime. The ladies final sees Scotland play Canada. Both games are at 2pm today. The Irish mens senior curling team – Johnjo Kenny, Bill Gray, David Whyte, Tony Tierney and fifth man David Hume, sponsored by Albert Bartlett – have made it through to the semi finals of the world senior championships here in Tårnby with what was, in the end, a fairly comfortable 8-4 victory over Finland. The two teams, ranked one and two in their section, met on sheet E, known to be a tricky sheet of ice, at 7pm tonight. By half nine it was over and the Irish team had a very sweet victory. The game was won on a four shot gain for the Irish – against the head – in the seventh end. The Irish back end were not firing on all cylinders in some of the early ends and the loss of a three before the half time interval could have been a killer blow. But, led by Johnjo, whose calm demeanour and ice cool shot play has inspired his team mates to try their very best for ‘The Big Man’, the team have grown in confidence throughout the entire competition. The three for the Finns in the fourth end happened when the Irish were lying two and well covered but the Finnish third elected to raise an Irish guard onto the two reds and got the angles perfectly leaving two Finnish counters lying. The skip then drew another shot for their three. It was a great shot and the Irish supporters were the first to show their appreciation of it. The score at the half time break was 2-4 to Finland. The Irish had chance to get a two back at the next end when the Finnish skip missed a double but Johnjo threw a bit heavy and the Finns drew for two. Johnjo’s only option was to draw the four foot for his one. At the sixth end, Irish third Bill Gray had an excellent hit and flop behind guards to lie two. It should have stayed that way but the door was open for Finland just a chink by the time last stones were played and the skip hit and rolled to lie second shot – a steal of one for the Irish. The killer blow came in the seventh when the Irish were lying three counters well spread out across the front of the tee by skips stones. With one Finnish counter lying fourth shot the opposing skip took an eternity to decide what shot to play. In the end he opted for a split on his own stone for two but was high and heavy away and pumped the only stone outside the house – which was Irish – into the rings and a very welcome count of four shots for Ireland. The semi final berth was in touching distance as the last end began. Johnjo didn’t risk the tick shot with lead Tony Tierney at this particular moment. He threw his two stones through and David Whyte cleared a guard with each of his stones. Bill Gray took a double with his first and it was just a matter of clearing one more yellow stone. The Finnish third was attempting to get cover behind the Irish stone on the wings with his last one. Halfway down, the Finnish skip could see it was caught on the guard and started to take his glove off to shake hand when it picked up and rolled into the top of the twelve foot. It was then left to Irish Curling Association President Bill Gray to deliver the coup de grace and nail the take out to take the team into tomorrow morning’s semi finals. The Irish will meet Norway, skipped by three time World Champion Eigel Ramsjfell, who just happens to be Johnjo Kenny’s all time curling hero. When a delighted Johnjo came off the ice he was asked about playing the Norwegian legend and if it would affect him? The other semi final is Canada, who beat Scotland, against Sweden, who beat New Zealand. Irish Mens Seniors team, sponsored by Albert Bartlett, make it to quarter finals of World Senior Curling Championships. It has been a long day for Irish curling fans at the World Senior Curling Championships here in Copenhagen and as fellow blogger John brown would blog – where to begin…..
After an extra end the Irish men’s seniors team, Johnjo Kenny, Bill Gray, David Whyte and Tony Tierney, sponsored by Albert Bartlett, finally, finally, got the better of a Latvian team that matched them shot for shot. After an exchange of singles in the first half, Ireland finally pulled ahead with a two in the seventh end when the Latvian skip just failed with an angled raise, leaving Johnjo to draw for a two. Trying to peel every opposition stone in the last end went awry when the Irish skip took too much ice, played peel weight and went sailing past the stone sitting at twelve o’clock outside the rings. The Latvians drew the shot onto the back four foot and Johnjo missed his run-back double leaving the Latvian skip an easy draw for his two and the extra end with the scores tied at 5-5. For the fans in the stands, this was torture. The team were nervous and there were some shaky shots. But, to cut a long story short, the Latvian skip drew to eight foot behind cover with his last stone. The Irish skip, Johnjo Kenny showed he had the four foot in his back pocket by drawing for the one shot needed for the win. Ireland and Finland were tied at six wins each in their group, so it was inevitable that the head to head would go down to an extra end before the Irish team – Johnjo Kenny, Bill Gray, David Whyte and Tony Tierney came out the winner and the team with the bragging rights. Ireland held a 2-0 lead going into the fourth end when the Finns took a one. The Finns took one against the head in the fifth end but the sixth was a nightmare with Johnjo Kenny knocking the opposition in for shot instead of freezing to their stone. 3-4. The head was then opened up and Johnjo played a great hit and flop at hack weight for shot in behind cover. The Finnish skip had a raise to lie two and take the game but at strike weight he jammed it and only got one. Extra end. Again. The end started in memorable style with Irish lead Tony Tierney playing his third tick shot of the World Championships. He is now known in Tårnby as ‘Tick, Tick, Tick Tony’. This was a godsend for the Irish boys who wanted to top their section and when the Finns skip failed to draw the shot when Ireland were lying two it was game over. In the draw for the quarter final on Friday night the two teams meet again – would you believe it! The Irish women went out on a high tonight after winning their final game here at the World Seniors by downing Finland. With former three time world champion, Norwegian curler Eigil Ramsfjell, an interested observer on the benches alongside the rink – he was hoping to update his tactics – the ladies played a steady game throughout. A very ropey seventh end could have seen Ireland lose a five, but thankfully the Finnish Ladies skip could not nail her last take out. The supporters club upstairs were amazed and thrilled with the way skip Marie called the last end and after lead Christina Graham put her stone though Louise and Gill peeled everything red in sight. Eigil was clapping every shot by this time and the Finns joined in the party by pumping one of their own shots through and gifting the game to the Irish. The ladies finish on a respectable three win three loss record. Both teams would like to thank everyone for the e-mail messages of support that they have been receiving. 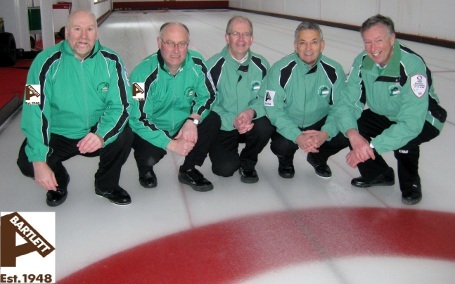 On ice that was tricky and frosty, the Irish Men’s Seniors team, sponsored by Albert Bartlett, kept their unbeaten record here in the World Senior Curling Championships in Denmark with a comfortable 8 – 3 victory against Slovakia. After losing one against the head in the third end, the Irish team, led by Johnjo Kenny, played a really solid end to get three and then stole a two to cruise into a fairly comfortable 6-2 lead. So comfortable in fact that lead Tony Tierney, who was feeling a twinge in a thigh muscle stepped off the ice to let fifth man David Hume back into the heat of battle at the seventh end. David took his lead duties very seriously when throwing his stone through the back as requested to put pressure onto the Slovakians to score. The opposition did get back on the board with a one but they knew their time was up and decided to call it a day. The Irish still look good for a quarter-final berth on Friday but, as skip Jojnjo Kenny warned, they will concentrate on tomorrow’s game against Latvia first and foremost. The Irish Women’s team, sponsored by Albert Bartlett, got back to back victories here at the World Senior Curling Championships when out-playing the home nation at the Tårnby curling rink during the lunchtime session. The team curled a good solid game throughout what was, on paper, a fairly evenly matched challenge, and they seem to have taken on board the advise of coach Gordon McIntyre to up anti in both tactics and shot-making. Singles were exchanged throughout most of the game and the ladies had the same problems as the men, playing at the same time on outside sheets with ice and/or stones. The women found a handful of stones suddenly losing or turning their handles on tricky ice. They got a much needed piece of luck in the sixth end when the Danish skip played for a tap up on her own stone. Unfortunately for her, that shot was never going to come off at hack weight and Ireland stole a one. Another steal at the seventh meant that the Irish girls just had to follow the basic tactics rule book – throw lead stone through the back and peel the guards after that to keep the head clear. When the Danish skip hit and rolled out with her first stone she indicated that she wanted to shake hands.